Experience Balinese cuisine, culture, and nature on a 5-hour tour. 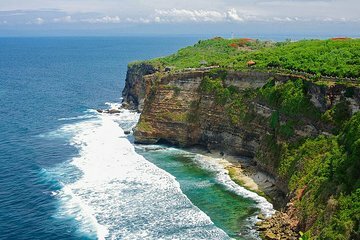 Relax as private transportation takes you from your hotel to Uluwatu Temple overlooking a 300-foot (90 m) cliff. As the sun sinks into the ocean, watch a live performance of the Kecak dance. Your evening continues with a seafood dinner on the white sand beach of Jimbaran Bay. After a filling meal, unwind during the return journey to your accommodation.